There's Karen Cooper, the Virginia woman who described how the Confederate flag, to her, represents defiance in the face of oppression. 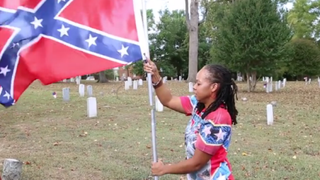 "I actually think that it represents freedom," Cooper, a black woman, says in a webisode of the documentary Battle Flag. "It represents a people who stood up to tyranny." According to the Washington Post, Cooper takes her support for the controversial flag—once flown by states that fought to maintain slavery—to the next level. She's a member of an advocacy group called the Virginia Flaggers that is striving to rebrand the flag because, its members say, contrary to popular opinion, it doesn't represent racism or hate. Then there's Byron Thomas, an African-American student at the University of South Carolina, who argues that one's intentions and actions dictate what the Confederate flag stands for. He explained how he doesn't use it to convey prejudice. "Dylann [Roof] decided to use his Confederate flag for racism," Thomas said, referencing the reportedly self-confessed gunman who fatally shot nine people in a historically black church in Charleston, S.C., June 17. "My Confederate flag that I own I do not use for racism," Thomas said. Thomas told CNN that even after the Charleston church shooting, he still does not find the flag to be racially offensive, since he thinks people are co-opting the image for their own personal racist agenda. "I'm entitled to my beliefs and how I choose to use a symbol," Thomas said. He argues that if the Confederate flag is denounced and banished, then Americans are letting the racists win. Courtney Daniels, an Alabama Marine, shares Thomas' views. He warns that people shouldn't let "cowards in bedsheets"—a reference to the Ku Klux Klan—"hijack" the true meaning of the Confederate flag.